It was a year of polarisation where each new event divided the world further and laid ground for events that would have far-reaching consequences. 016 will go down as the year that politics left our drawing rooms and dinner tables and invaded our relationships, our friendships and WhatsApp groups. It was a year of polarisation where each new event divided the world further and laid ground for events that would have far-reaching consequences. 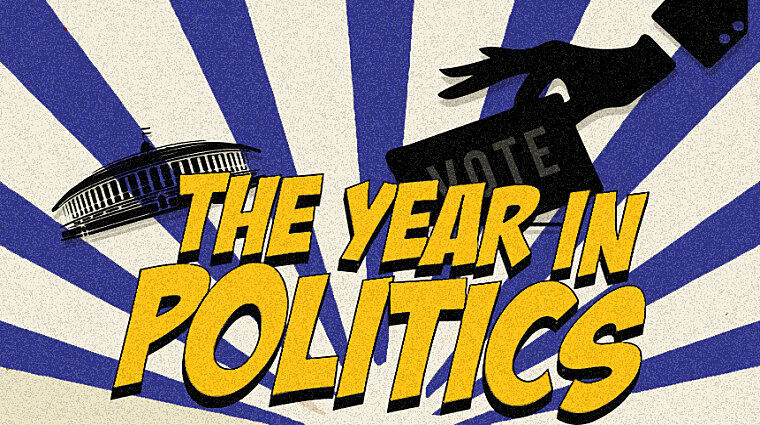 It was the year of politics, pregnant with possibility. Only the future shall decide if it will deliver. In a year that saw several incidents of cross-border fire between India and Pakistan, one stood out. It was the day the government announced that it had conducted a “surgical strike” on terror launchpads in Pakistan. The result of this decision was a surprising escalation to talks of war. As social media exploded with congratulations and contemplations over how long it would take for nuclear weapons to travel between Islamabad and New Delhi, words like “punish” and “retaliation” were thrown about in abundance, and poor Fawad Khan was sent back home. The few voices that argued for peace were labelled terror sympathisers by the online Bhakt army, and “peaceniks” by the Right-wing media. They were seen as lazy, anarchic, “intellectuals” who didn’t care that soldiers were dying on the border. And so, a new strain of “soldier-led nationalism” was born. The “surgical strike” thankfully didn’t escalate into full-blown conflict, but it showed us a picture of a nation that was uncomfortably eager to go war, a nation hell bent on revenge, a nation so willing to destroy the enemy, that it was willing to destroy itself in the process. I was on my way home, pleasantly full from dinner on a rainy August night, when I turned to a video I’d been meaning to watch all day. Irom Chanu Sharmila, Manipur’s “Iron Lady” had broken her historic protest fast – the longest in the world – earlier that day. I was transfixed not by what was unfolding on my phone screen but by the import of the act. Sixteen years had passed since Sharmila had embarked on the demand to withdraw the Armed Forces Special Powers Act from her home state; sixteen years since she had willingly put a morsel of solid food into her mouth; sixteen years of physical or mental incarceration. As Sharmila exchanged one democratic instrument for another one, she tried to neutralise the state’s canny efforts to project this as an individual struggle, and not as an insistence on actual political change. Whether Sharmila succeeds nor not, she remains an example of governmental apathy that greets nonviolent methods of protest. Her peaceful dissent has failed to move the Indian government and may go down in history as perhaps the last disciple of a high-profile Gandhian protest. The end of an era. In a country on its way to ultimate submission, left bereft of upcoming young leaders, one spring night in March held a great deal of promise. The clouds parted and a 5’6’’ Hercules descended from the heavens. For one night, for one hour, when JNUSU leader Kanhaiya Kumar’s fiery call for Azadi, for freedom within India, for freedom to question was telecast live across news channels, it seemed as though the country’s agitated progressive youth was going to clean the stables. As India moved from intolerance to demonetisation in the 2016 buzzword power rankings, what remained constant was the dispensation’s disdain towards any sort of questioning, with those raising them classified under a file loudly labelled “anti-national”. Many would go on to find a mention in this file but Kanhaiya Kumar and his call for Azadi was the original anti-national. In a year when hope was in short supply and courage even rarer, when the air projected dissent in whispers, when actors changed their beliefs to pander to the Right’s dominant sensibility, Kanhaiya Kumar’s rebellion reminded Indians of their once-vital fortitude. His star may have faded, but for that one moment in time, when he stood up and screamed for Azadi, Kanhaiya Kumar was everything India needed to be its equal, secular, balls-to-the-wall self again. The 2016 US presidential race threw up quite a few unpleasant surprises. It also gave us a handful of thought-provoking moments, the impact of which one can only hope lasts beyond the American political season. Michelle Obama’s powerful 25-minute speech in New Hampshire condemning Donald Trump’s lewd remarks against women was one such riveting moment in a year rife with vitriolic political discourse. The outgoing first lady’s stinging denouncement of Trump was defining not because of its content, but because it reminds us that even in the world’s biggest political battles, human decency trumps ideology. Mrs O went beyond politics as she spoke passionately about harassment that women face on the streets and at the workplace. She spoke about that familiar “sick, sinking feeling” us women endure when a stranger passes vulgar remarks. Or when a guy at work “stares a little too long”. Her words were honest and relatable as she herself has been subjected to such disdain time and again. And while Trump’s unnerving behaviour reminded us of men who touched us without invitation and made us feel uncomfortable, Michelle Obama reminded us that we deserved to be treated with dignity. As she delivered what is arguably the most powerful speech of the year – it might have been an unwitting first pitch for the 2020 presidency. The hashtag #Michelle2020 trended on Twitter soon after the speech as viewers hoped to fast-forward by four years to have Mrs O deliver them from a vitiated, polarised America.